How can Peace Literacy help global sustainability? We’ve put together a Concept Note on the relationship between Peace Literacy and the UN Sustainable Development Goals - please share widely! 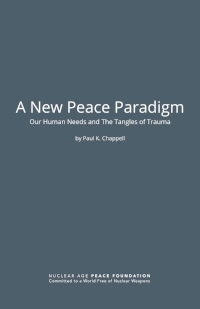 Paul K. Chappell is the Peace Literacy and Leadership Director for the Nuclear Age Peace Foundation. A graduate of West Point and a veteran of the war in Iraq, he created the idea of Peace Literacy after his time in the military. He develops the idea further in his seven-book series The Road to Peace, where he writes about waging peace, ending war, the art of living, and what it means to be human. To learn more about Chappell, his work, and his speaking schedule, visit his website. Peace Literacy is a growing movement of educators and concerned citizens who want to empower people with the training, skills, and understanding needed to heal the root causes of our problems, rather than merely addressing surface symptoms. There is a lot you can do to help create a more peace literate world, we have provided a few ideas here. Our understanding of peace is only as good as our understanding of the human condition and trauma. To gain a deep and practical understanding of extremism, trauma, and the nature of human happiness, and to solve our national and global problems in the twenty-first century and beyond, we need a realistic and pragmatic model of the human condition that helps us understand our human needs and the tangles of trauma. Peace Literacy is based on research about basic human needs such as self-worth and belonging, and how trauma gets entangled with these needs. You can find a recently updated essay on this topic, available for download, here. Just turn on the tv, or talk to your kids. The need is clear. 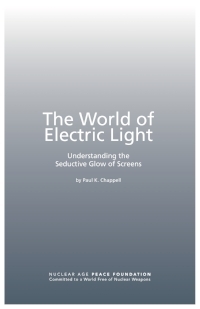 Chappell has published a new pamphlet The World of Electric Light: Understanding the Seductive Glow of Screens focusing on the technological changes for which new ethical frameworks are needed. Understanding how social media platforms feed our shared human needs for self-worth and belonging can help us better adapt to rapid technological change. You can download a copy here. "If we aren’t taught the language of peace, how can it be spoken?" Reflections from Michael Gardner, President of the Santa Barbara Rotary Club, after hearing Chappell's presentation on Feb. 9, 2018. A peace literate world is a secure, just, and prosperous world. For your school, workplace, or community organization.